This object has a rectangular dark brown wooden frame that is open in the center except for one bar which runs lengthwise across the frame just below the center. Drilled into the inner part of the frame are small holes into which are inserted cream/yellow colored cylindrical sticks except for in two spaces in which are inserted metal rod. On the top half of the frame the sticks hold five circular dark brown wooden beads. On the bottom half of the frame under the lengthwise bar the sticks hold two circular brown wooden per stick. Wrapped around the corners of the frame and on the front of the parallel bar there are flat metal sheets attached to the wood which are silver in color. 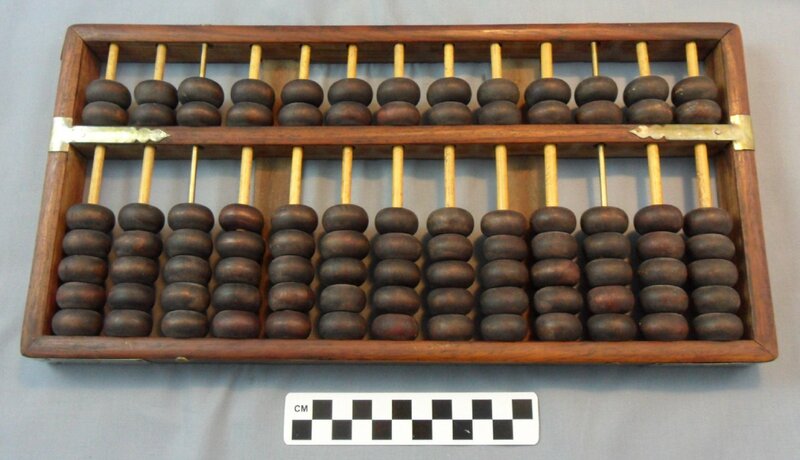 On the back of the abacus there are also two flat wooden bars that run horizontally down the back of the counter giving the structure support. All the wood of the object has an oily type finish on it.